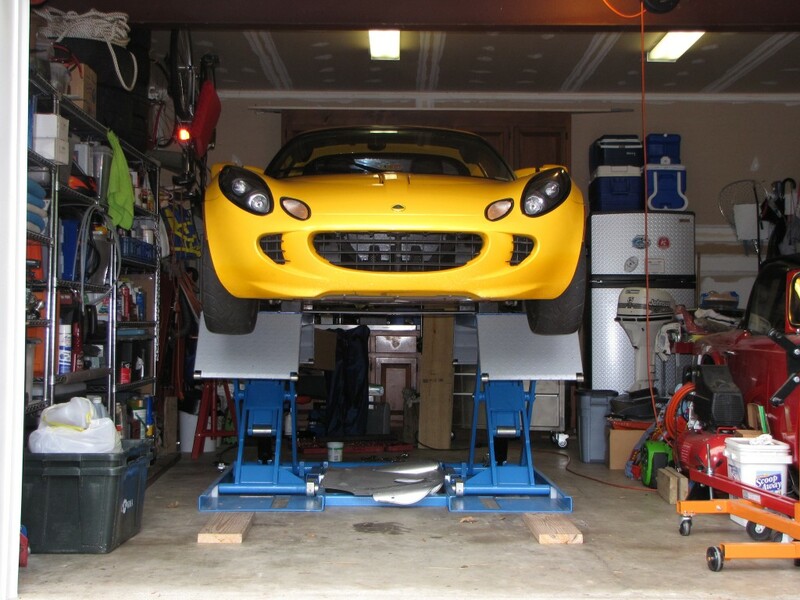 Reviving an old thread, but how to support the Elise on this style of lift? 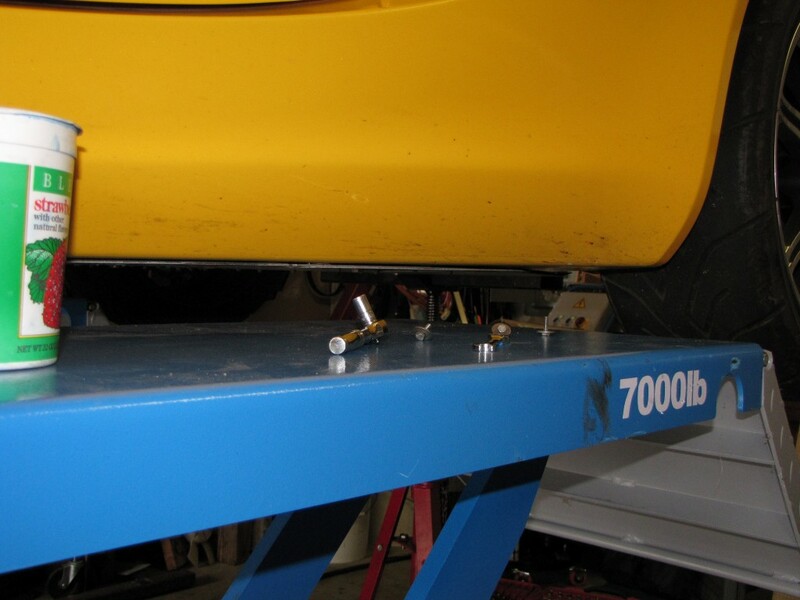 I am still very much enjoying this lift and it has worked great for the large variety of cars that I use on it. It is a very stable, safe and easy lift. When not in use, I just leave it flat and have no problem just parking over it. Put 24" long 2x8 pieces of wood flat on the floor in front of and behind each lift runner. These are to get the car a little higher for the rubber blocks to slide between the lift and the car. 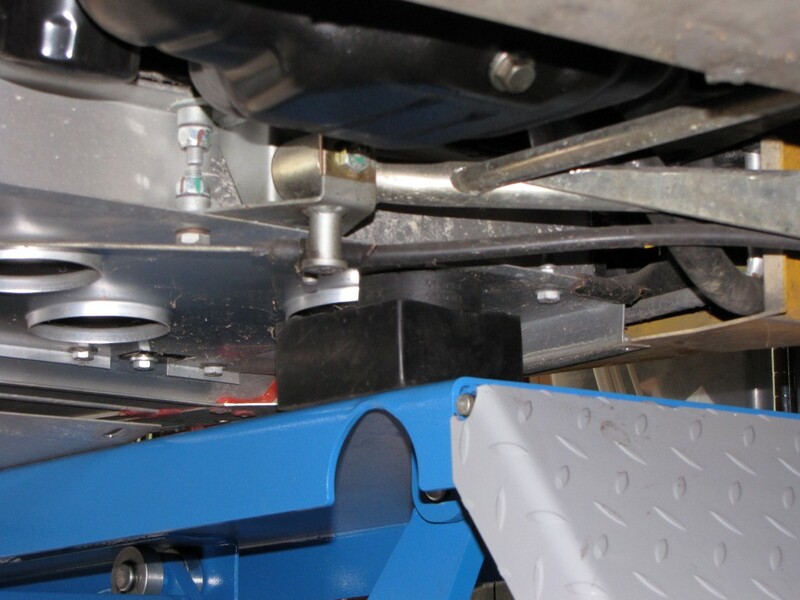 Pull car onto the lift aligning front of rear wheel arch with the back edge of the lift runner. 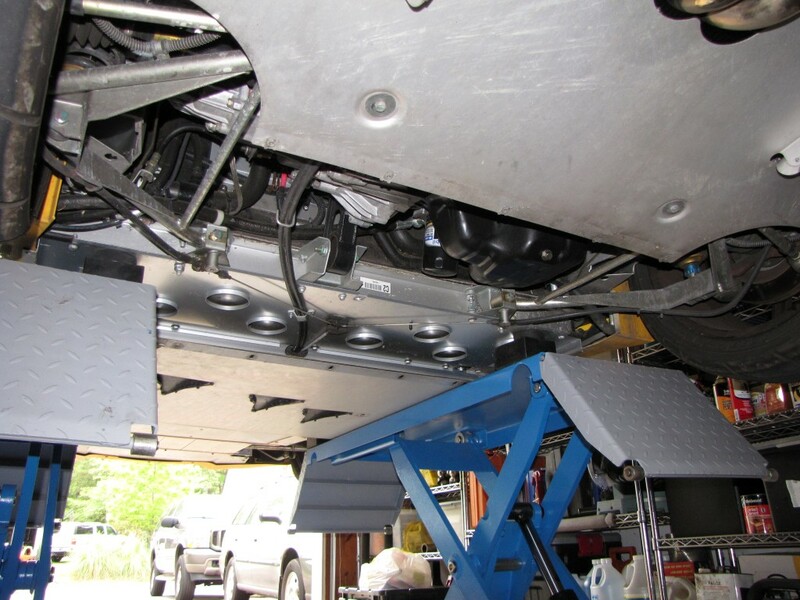 Slide rubber lifting blocks between Lotus and lift runners. The front blocks aren't quite to lift point B up front because of the runner length, but work fine just behind there. The critical ones are lift point C to keep the car from flipping backwards. For this, I position the rubber blocks on the outside edge of lift point C.
Raise lift to full height. For things that don't require the removal of the engine access panel you can stop here. At this point you can detail the car easily, perform wheel, brake and suspension work. You can also remove the diffuser for exhaust work. 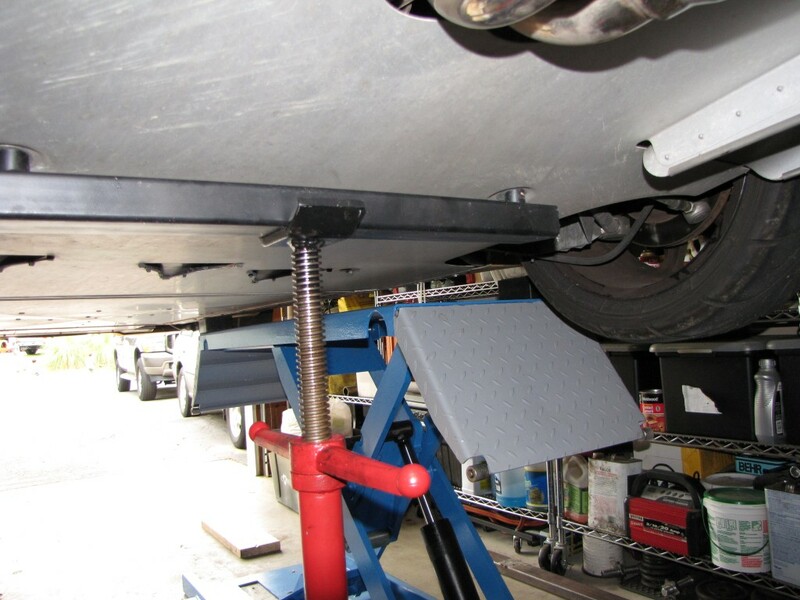 Place screw type jack stand and Jack Helper under the rear lift point. Screw it up just a bit to remove weight off of rear rubber lifting blocks to allow for removal of engine access panel. 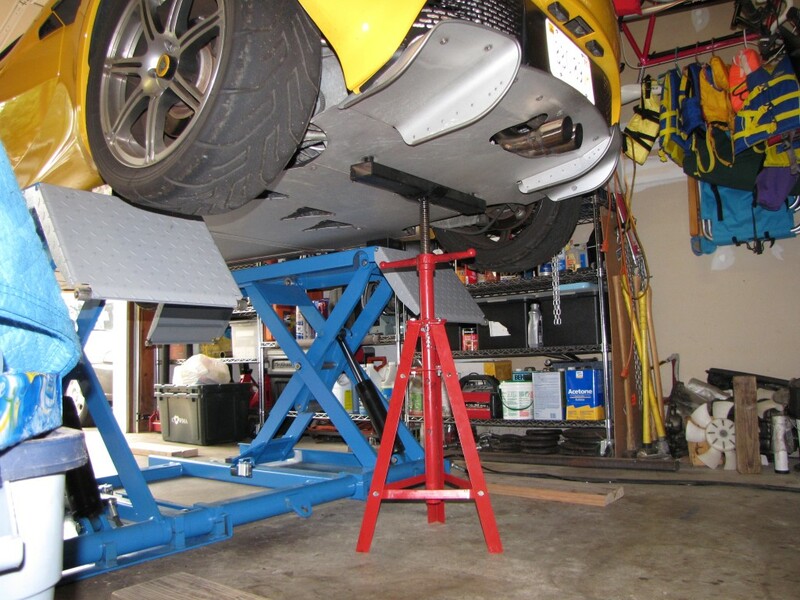 With this screw type jack stand, it is VERY EASY to rotate the handle lifting the car. Slide rear rubber lifting blocks out and remove bolts for engine access panel. The access panel will come straight down and rest very nicely on the lift runners. You can then just slide it forward and out of the way. 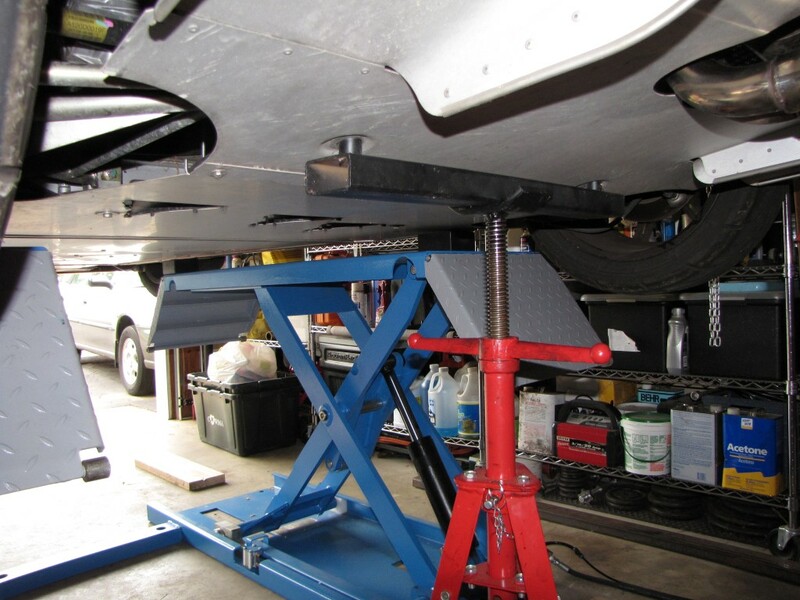 Place the rubber lifting blocks back under lift point C and take a few turns off the jack stand lowering the Lotus back down on the rubber lifting blocks. I also added hockey pucks at this point to make up the space difference with the panel removed. Instead of hockey pucks on top, you could use 2x6 blocks under the rubber lifting blocks. 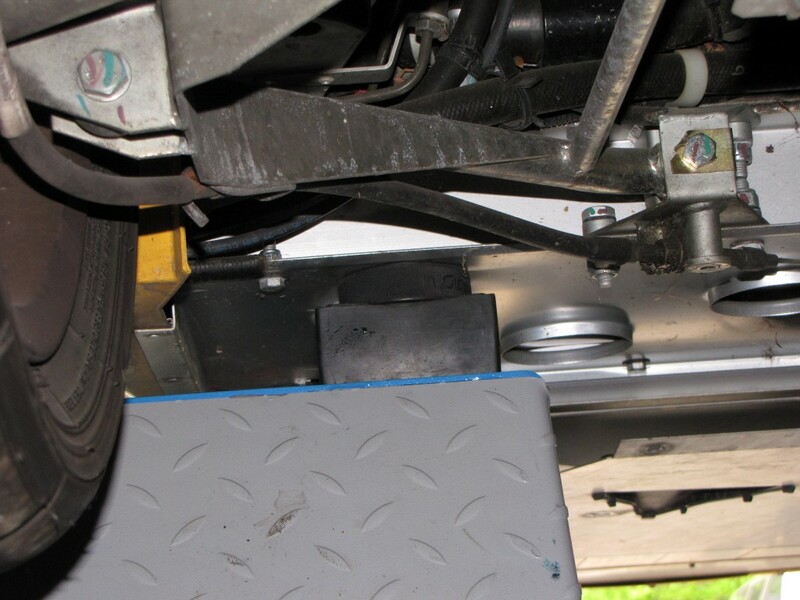 You can now remove the jack stand and Jack Helper out from under the car. Eventually I might make some permanent pucks/blocks that will stay between the shear panel and the engine access panel. These would better support the Lotus when lifting with the panel on, but I have had no problems with my current lifting method. I would make them out of either Delrin or StarBoard (both high density polymer material). Last edited by Baysailor; 11-01-2012 at 05:58 PM. Baysailor that is a nice setup. I like it. I will just make my own similar to the TAT-Concepts pucks (first link). They use existing bolt holes. I will make then from a block of Delrin or King StarBoard (both high density polymer material). Last edited by Baysailor; 11-01-2012 at 06:11 PM. Thanks for that incredibly thorough response!! When you initially lift using the outside edge near lift point C it isn't a problem lifting it using the edge of the panel? I circled where it looks like you lift when the access panel is on. Gone, but not forgotten: '91 NSX, '95 Z3, '79 280ZX, '66 Mustang and others. Friends don't let friend's drive 4-doors. I have lifted my Elise probably about 15 times or so and have not had a problem yet. It is just on the outside of lift point C and the large rubber blocks spread the load out pretty well along the aluminum extrusion there and the panel. There has been no bending, deformation, etc. and I definitely always check this area well! When I do lift here, it has always been with the engine access panel on as this provides lateral strength for that outside edge. However... all that being said... I wouldn't want someone else doing it just because have. I would definitely recommend making and installing pucks that go between the shear panel and the engine access panel like I mentioned and linked to above. The puck would mount to the shear panel at lift point C filling the gap between the shear and engine access panels. This would allow you to lift using lift point C with the engine access panel on. I really need to get around to making some of these for my car! The bolt hole just to the right of the area you circled is the one that people use for holding the pucks in place. I have also seen pictures where people have mounted the pucks to the engine access panel instead. Last edited by Baysailor; 11-01-2012 at 04:52 PM. Anyone know of US sources for these? Approx 10-12' height (there would have been approx 13' but there is a beam). Right now the Lotus takes one side of the garage and gets driven from Spring to late fall otherwise sits there which annoys the other half lol. Ideally I'd like to be able to get three cars in the garage and the option to actually work on the car. What are everyone's thoughts on brands, ideally I'd like to stay under 2k. I bought one from Superlifts.com several years ago to stack cars for more garage space as well. They are kind of generic but has worked well. Only need about 10' 6" to stack two cars. Make sure u factor in garage door opening... Had to modify mine. 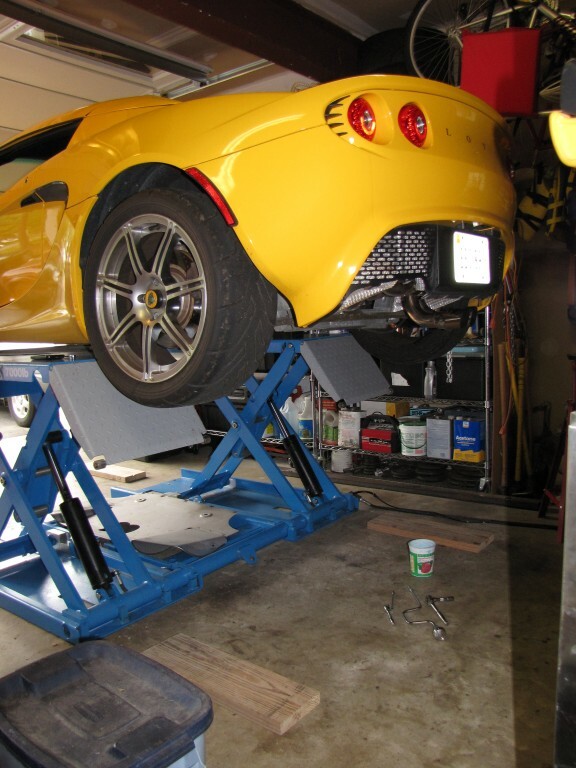 My garage is only 10' 1" can put the lotus all the way to the top. had to modify the garage door to go higher and get ride of the traditional center door opener but i was in the middle of replacing it anyway. Complete and with a little room to spare. Hi BMan, what is the Garage Length and Width? I'd like to get a 4 post but may not have enough floor space. I have about 10.5 height. I don't remember exactly the dimensions but the lift itself is there smaller one. 9'7" with motor Wide and 14'7" Length. I want to say my garage is about 12'x17'. I do have enought room to slide around the posts and enough room in front of the lift to store tools chest, stand up air compressor and my garbage can. Here are a couple of pics during my install that might put a better perspective on its size. I think I'm taking the plunge for the same lift. I was thinking about the MaxJax but would prefer a 4 post. 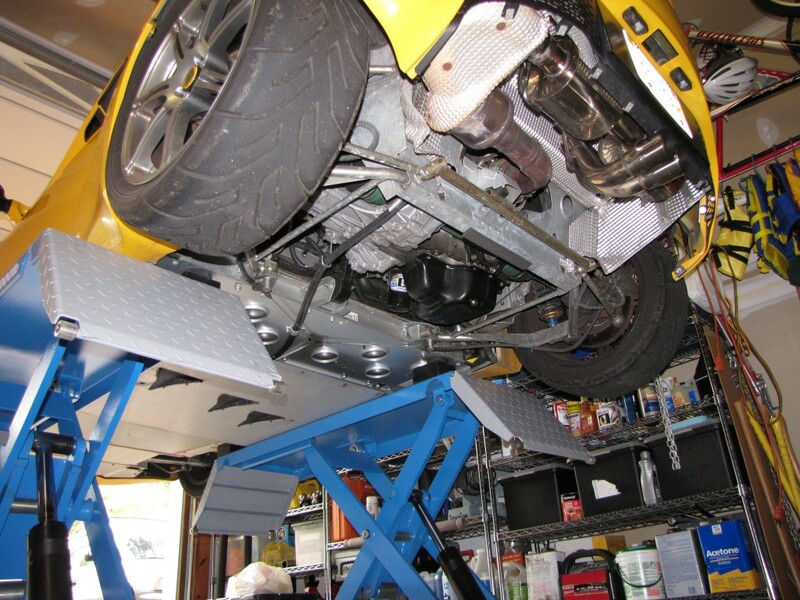 It looks like you use the driveway for the ramps, are the easily removable when the garage door is closed? 4 post is nice you don't have bolt anything down. I got the combo package that has the jack lifts so i can still lift the car off the ramps and work on it (brakes, oil, muffler, etc). Yea I do have the ramps out to the driveway. Yes they are easily removable but mine are not anymore I modified them to fold up on the lift so I wouldn't forget to put them on when taking the car out. I will post pics this spring of my garage transformation. I have an M3 that wil be going below the Lotus but there should be plenty of space. Should fit I had an E36 M3 above a 135i at one point. Love the E36 M3, I used to have one! Do you have any shots off using the Jack on the Lotus?